Fender CD-60CE is not the typical beginner guitar you’ll see people talk about. Although cut away designs aren’t usually recommended for first timers, the CD-60CE is different and deserves some kind of attention. The quality you will get from the CD-60CE is more than the money you will spend. It makes one of the best starter guitars out there and what’s more important is that it comes at a very affordable price. If you are the type of person who prioritize looks and design over other things, this acoustic-electric guitar is just the right fit. No wonder Fender just announced that the CD-60CE belongs to their best selling guitars. The classic look of this cut away model comes in a mahogany back and sides, and laminated spruce top. The fingerboard is made of rosewood which is attached to a nato wood neck with 20 frets. Adding to the beauty of this masterpiece is the headstock, the die cast tuning pegs and the chrome finish in which, all are screaming in style. Everything is perfect with this guitar except that the pick guard only comes in a single layer attached on top. But the edge of this model among other guitars is that it features a special electronics which guarantee full control and quality of its sound. Design wise, the black pick guard, mahogany color and bronze strings complements each other perfectly and comes with a hard case that really looks very nice. Fender CD-60CE sounds perfect for a nice acoustic guitar. It plays excellent in different music styles, which is expected for a Fender guitar. It can be plugged into an amp and do some heavy metal stuffs too. You just have to be careful with the settings though, as this masterpiece can get very loud sometimes. For the usual strumming and finger picking, this guitar sounds really nice because of its mahogany top. The highs are very nice without sounding too bright and the lows are bassy but not too overpowering. Overall, this is a great sounding guitar that has a crisp, full and rich sound. The Fishman electronics has even made this guitar a more convenient one and made its range capacity really wide. Use it solo or with a band and get the best of both worlds for it’s a highly flexible guitar. Additionally, I have been completely blown away by how comfortable it feels when I started playing this guitar. 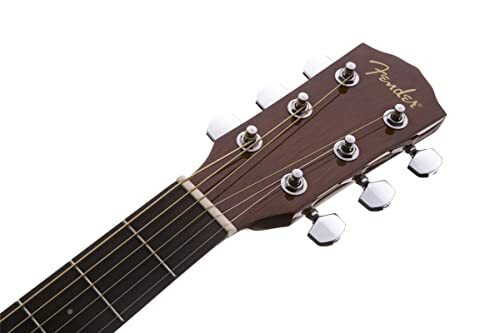 The strings are soft on my hands, it’s sturdy and feels exactly like that of a high quality guitar, although I wish they could have made a lighter one to make it more portable. Other than that, I don’t see anything to dislike about this one. It looks good, sounds good and is affordably priced. That’s the best traits this amazing guitar has, all at one. In fact, it’s everything and more if you can just lay your hands on it right now. What are the cons of this guitar? In real honesty, there’s really very little to dislike about this acoustic guitar. I like the sound it makes, which is both sweet and warm. 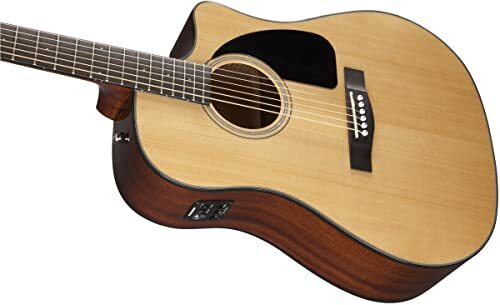 And the Fender has always been my go to brand in terms of durable and excellent sounding guitars and the CD-60CE leads as an example to that. Although the CD-60CE works perfect for me, I have known some left hand guitar users wish they could use it too, because this is especially made for right hand users only. I already have mentioned about its weight which is quite heavier for a dreadnought, but all these are just minor issues and don’t really matter that much. It is really well built and makes a good deal for entry level guitars. I have read a lot of positive feedbacks more than negative ones and I can see why when I was convinced to buy this guitar. Overall, this guitar is not just for entry level performers but for professionals alike. It is an absolute stunner both for having a great tune and looks, and the electric feature is what makes it ahead of similarly priced guitars. The bottom line is, you can’t get other guitars of this price that’s as good as the CD-60CE. It uses selected high quality materials and guarantees to make the most out of your cash. I typically use it for all kinds of music and it never fails to get everything well done considering its price. A huge plus for me is its ability to stay in the right tune even after several hours of playing the guitar. So, for those of you, who are looking for a guitar that’s worth your every penny, try to consider the CD-60CE.